HALEKALA CRATER - A 58-year-old hiker was found safe Monday morning after spending the night in Haleakala Crater and making it out by himself, officials sai. Gov. Neil Abercrombie received praise Monday for supporting an extension of television and film production tax credits, alternative energy development and investment in the state's building projects in his State of the State address. WAILUKU - President Barack Obama's State of the Union address will be carried live at 4 p.m. today on KAOI 1110 AM and 96.7 FM, according to an announcement from KAOI Radio Group. Also, a tape of Gov. KIHEI - The Occupy Wall Street Maui group will hold demonstrations this week near the intersection of Piilani Highway and Kanani Road to protest Monsanto and genetically modified crops. The demonstrations began Monday and continue through Sunday. If you’re hankering to go to Oahu, but not sure when to go, perhaps you’d like to go during one of the many excellent festivals. To help you, I’ve created this handy dandy list of Oahu festivals – which mixes in input from the nice folks at the Oahu Visitor’s Bureau, plus my opinion. Honolulu Festival celebrates cultures from across the Pacific with art, music, dance and crafts. The event culminates with a Grand Parade in Waikiki followed by fireworks. The Waikiki SPAM® Jam is an exciting annual street festival that takes place on Kalakaua Avenue in Waikiki. The event celebrates Hawaii’s love of SPAM® and features a variety of Honolulu’s finest restaurants serving up SPAM®-inspired creations. Two entertainment stages provide non-stop entertainment ranging from hula dancers to local musicians, and merchandise vendors sell SPAM®-themed items and Hawaiian crafts. Proceeds from the event benefit the Hawaii Food Bank. Mele Mei celebrates the unique music of Hawaii with workshops, concert performance and award ceremonies. Every year on Memorial Day, thousands of people gather at Magic Island at Ala Moana Beach Park to honor ancestors and loved ones who have passed away. At sundown, more than 3,000 candlelit lanterns are set afloat on the ocean, a traditional Buddhist rite originating in Japan. The ceremony is based on the theme “Many Rivers, One Ocean,” and serves to honor those who have sacrificed their lives in war, pay respect to ancestors and loved ones who have passed away, and pray for a harmonious and peaceful future. Lantern Floating Hawaii also features live entertainment by local and international musicians, as well as inspiring speeches. The Pan-Pacific Festival is a three-day international cultural celebration that features a weekend of Pacific Rim cultural performances, demonstrations, hula, food, hoolaulea (block party). The event culminates with a colorful parade with thousands of participants in lively costumes marching down Kalakaua Avenue in Waikiki. This colorful celebration honors the reign of King Kamehameha, who was responsible for uniting the Hawaiian Islands under his rule in 1795. The King Kamehameha Floral Parade extends from Iolani Palace to Kapiolani Park and features brightly decorated floats, energetic marching bands and traditional pa‘u riders who represent a Hawaiian royal court on horseback. 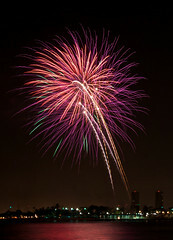 Hawaii celebrates Independence day with excellent fireworks shows on both July 3 and 4. For an idea of what this year’s celebration may entail, see this comprehensive round up of Oahu July 4th fireworks and celebrations from 2011. The Prince Lot Hula Festival is held in the beautiful Moanalua Gardens, features hula halau (troupes) gracing the hula mound for spectators to enjoy. The festival showcases Native Hawaiian culture through crafts, kapa making, lauhala weaving, lomilomi massage, traditional Hawaiian games, and more. Duke’s OceanFest, a weeklong festival, features a variety of exciting water sports competitions, including longboard surfing, surf polo, swimming, standup paddling, and other events that pay tribute to the surfing and swimming legend Duke Kahanamoku. The festivities culminate with the Duke’s Statue lei draping ceremony on August 24, the anniversary of his birthday. On Oahu, the Aloha Festival celebrates Hawaii’s music, dance and history, and is intended to preserve the islands’ unique traditions. Festivities on Oahu include a Waikiki Ho‘olaulea on September 15 and a floral parade on September 22. If you can’t include any of these festivals we’ve mentioned, don’t worry, there’s almost always a festival or celebration of some kind happening on Oahu. To find out what special events might be going on during your Oahu vacation, visit GoHawaii.com/Oahu and use the Vacation Directory from the right column. Be sure to click on the Events tab first, then enter your desired dates. Have you been to any of these Oahu festivals?